Russian ballet dancer and choreographer; brother of Bronislava Nijinska. 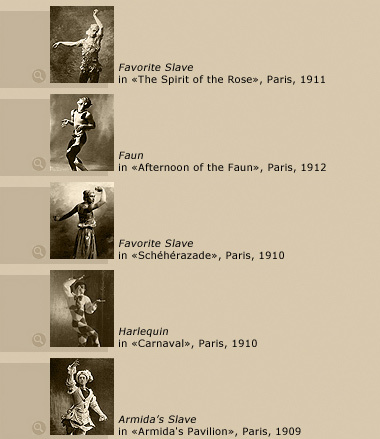 Nijinsky is widely considered the greatest dancer of the 20th cent. and was ballet's first modernist choreographer. He entered the Imperial Ballet School, St. Petersburg, in 1900 and made his debut in 1907. He traveled to Paris (1909) and, as premier danseur in Diaghilev's Ballet Russe, was the first to dance the leading roles in Petrouchka, Les Sylphides, Scheherazade, and The Spectre of the Rose, all choreographed by Fokine, and in ballets he himself choreographed—The Afternoon of a Faun (1912), The Rite of Spring (1913, for which Stravinsky composed the famous score), Jeux (1913), and Till Eulenspiegel (1916). Nijinsky developed a system of dance notation that was not deciphered until 1984; since then a number of his reconstructed ballets have been performed. Often considered the greatest male dancer of the 20th cent., Nijinsky was noted for his intensity and eroticism as well as for his superb technique, particularly his jeté and elevation. His relationship with Diaghilev was stormy, ending bitterly when the dancer married. In 1919, Nijinsky's career was abruptly terminated by disabling schizophrenia. He lived in retirement in England and Switzerland until his death.